A Canadian man has been caught trying to hide assets from bankruptcy because the wrong fonts were used in documents. Gerald McGoey, the former CEO of Look Communications filed for bankruptcy over a year ago. He presented trust documents that appeared to shield two properties from his creditors. But there was a problem with both documents, supposedly written in 1995 and 2004, used fonts that didn’t exist until many years later! The 1995 document used Cambria, a font which didn’t exist in any form until 2002. The 2004 document has Calibri, which went public five years later. 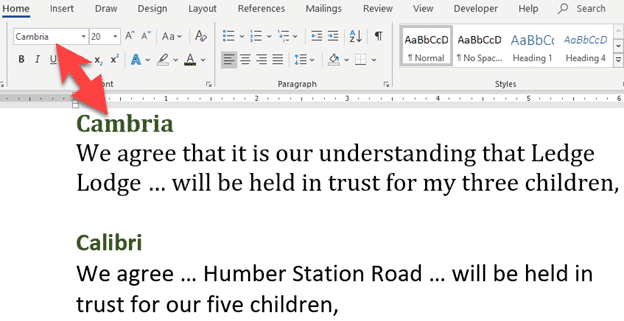 Calibri will be familiar to most of you because it’s the default font in modern Microsoft Word. Font evidence came from Thomas Phinney, who calls himself a “font detective“. The court didn’t rely on font evidence alone because there were other facts that raised suspicion about the reality of the two trusts. It’s a lesson for any would-be fraudsters. It’s easy enough to look up a font history. Wikipedia is a good start or the Microsoft Typography site. < Office 365 ‘Lifetime’ plans are a lie > Which Office 365/2019 to choose – 64 bit or 32-bit?